Our pre-trip research led us to believe that the bus ride from Inle Lake to the pagoda-studded plains of Bagan would likely end in disaster. Bloggers have described the minibus journey as the worst experience of their lives: 50+ people crammed into 30 seats, choked by dust, suffocated by heat and nauseated by tight turns and projectile vomit. Trip Duration: 12 hours. Yeah, thanks but we’ll pass. Getting from Point A to Point B anywhere in Myanmar requires an incredible amount of planning, flexibility, and patience. Whether it be by train, boat, plane or bus, the infrastructure is simply not conducive to traveling long distances. Short distances too, for that matter. The 20mph seven-hour train ride was a perfect example. But in most cases, apart from the discomfort and time, you can assume you’ll arrive safely at your destination. In most cases. 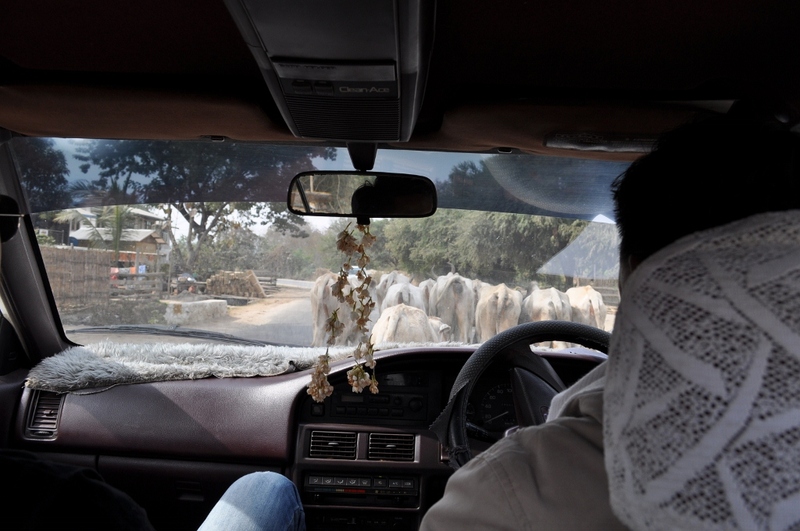 With no train option from Inle Lake to Bagan, we opted to hire a private driver which was cheaper than the flight and faster than a vomit-filled bus. Other bonuses included: leg room, air conditioning, and the flexibility to stop whenever and wherever we wanted. But as always, if it seems too good to be true, it probably is. Burma has a unique driving situation. They kept the colonial-era British cars (driver on the right side), but they drive like Americans & Europeans on the right side of the road. Further complicating matters was the fact that the two-lane roads are home to numerous modes of travel: trucks, buses, motorcycles, bicycles, cars, ox cart, horse carriages, and walkers. Despite the lack of passing lanes and sidewalks, passing was typically an easy affair. To signal our presence and the fact that we wanted to pass, the driver honked his horn (10+ times seemed to be the norm). At that point it’s the responsibility of the slower moving person/vehicle/animal to move to the right or risk getting hit. Passing a larger vehicle was a bit trickier, especially on a curvy mountain road. Slow-moving buses and trucks often flashed their left-hand turn signal as a way to signal to our driver that the coast was clear to pass. But this was more a friendly gesture than a rule of the road. In the event that the driver in front did not give us the “Okay to Pass” signal, the driver would attempt to pass anyway. It’s a horrible system because the lack of a the turn signal means one of two things: 1) it’s not okay to pass, or 2) I’m not a friendly driver and I can’t be bothered to let you know that the coast is clear. So what would you do in the following situation: you’re driving on the right side of the car, on the right side of a narrow, curvy, two-lane road and you have a bus in front of you. Do you a) wait for the bus to signal to you that it’s safe to pass, b) ask the passenger on the left to check if the coast is clear, or c) try to pass on your own and cross your fingers? Clearly option A was not in the cards – there was no telling how long it would be before the road straightened out and we negotiated a flat fee, so the driver was motivated to get us to our destination in the least amount of time. Option B was difficult considering the language barrier, though I think gestures would have been okay in this case; but rather than attempt to communicate, the driver simply continued to chew his betel nut and chose option C, the source of my first grey hairs. Poor Eugenio was sitting in the passenger seat. So as the driver slowly inched into the on-coming lane, completely blind, it was Eugenio that saw first whether or not we were in for a head-on collision. Lip biting, white-knuckles, breath-holding, sweating, and stomach churning were the norm and for the sake of the sanity of my parents (who do read this blog from time to time), I won’t go into any more detail of that horrific journey. Let’s just say that we stepped out of the car, ecstatic to be in one piece and with an important lesson learned. Even the vomit-filled bus option had its merit: we wouldn’t have been fearing for our lives.